If you are considering repainting your home’s interior but have never done so before, you may not know exactly where to begin. Making the hasty decision of repainting your home without doing ample research beforehand could leave you with an end result that leaves much to be desired. From streaky paint to spills and stains, there are many problems that can arise while painting your home’s interior. 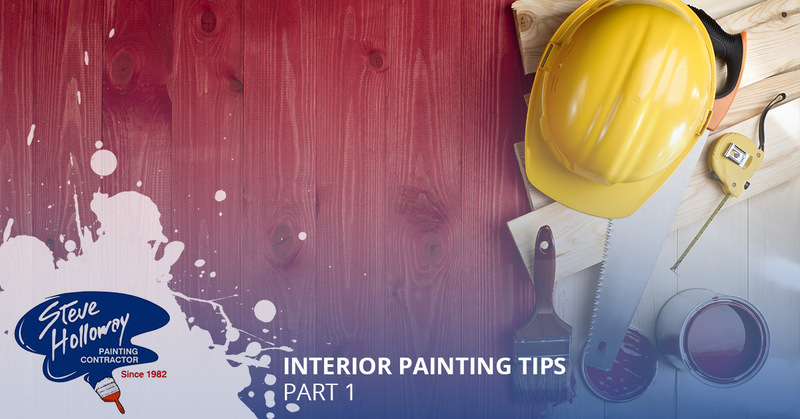 That’s why, in today’s two-part series, we will be taking a look at a few tips designed to make your next interior painting project a breeze. With more than 35 years of continued success in the Bakersfield community, we have completed a number of commercial and residential painting projects with ease. We know that you value the appearance of your home, which is why we provide free project quotes while working directly with each of our customers so that they can remain informed during every step of the process. With a lifetime of expertise in exterior painting, intertior painting, and deck painting and staining, we know that you will be pleased with our high-quality painting services. Learn more about how to set yourself up for success during your next interior painting project by reading more below. Before you grab for a paint brush or open a can of paint, you should first start by prepping your surface. Many walls and ceilings throughout homes can become dirtied over time by collecting dust, grime, and sometimes grease. These substances can play a major role in your paint’s level of adhesiveness, and will produce lackluster results if not properly addressed beforehand. For this reason, you should consider cleaning your walls with soapy water, fill any holes in your walls with spackle, and remove any outlet covers that may still be attached to your walls. Once you have cleaned your walls with water, you will be required to allow them to dry overnight before beginning your interior painting project. Instead of painting your home’s ceilings with a small paint brush, consider using an extension pole for all those hard to reach areas. Not only do extension poles allow you to extend your paint roller’s reach, they also help to cover larger areas so that you don’t have to spend an unnecessary amount of time using a paint brush. Extension poles also eliminate the need for a step ladder, so you won’t have to worry about an injury occurring while painting your home’s interior. Saving time and reducing risk are just two of the many benefits that extension poles can provide when it comes time to carry out your next painting project. These are just a few simple ways that you can make interior painting as easy as possible, so that you can spend less time worrying about the quality of your paint job and more time enjoying your newly renovated home. If you are interested in receiving a no obligation price quote, simply complete our price estimate request form located on our website! However, if you have any additional questions or concerns, feel free to reach out to one of our friendly staff members today. We look forward to working with you!